I think I *may* have mentioned once or twice how much I enjoy stitching out these in-the-hoop machine embroidery designs from Embroidery Garden. And you know it was only a matter of time before they were decorated with Westies! Here's a look back at some of the Westie-themed in-the-hoop accessories I've come up with so far this year, starting with the newest. I call this one a 'Gadget Holder/Zipper Case' - it's made using the blank version of EG's Monogram Zipper Case, but I've replaced the ribbon loop at the top with a narrow fabric strap and a swivel lobster clasp, so it can be attached to a handbag or tote. The entire zipper case is padded with cotton batting, lined in white cotton fabric and all the raw edges have been neatly finished with a 3-thread overlock stitch on the serger. The fabric for the front and back have been fussy-cut so that the Westie face is centered. I chose white thread for the quilting stitches, so it would blend better where they cross parts of the Westie's face. This gadget holder is the right size for carrying a cell phone, digital camera or other small device - or just about anything else! I started out with one yard of the Garden Westies fabric and made a half dozen zippered coin purses using the blank version of EG's 4x4 Monogram Zipper Case. The design repeat was just about perfect for centering the larger Westie face on the front and a smaller face on the back, with just the green floral sections for the lining. The raw edges inside have also been serged for a neat finish. A decorative clasp hook on a split ring can be used to hang this little coin purse along the edge of a handbag for easy access. With the odd pieces left over from the coin purses, I decided to make some Garden Westies Keyring/Card Holders using the blank version of EG's Monogram Key Chain Card Holder design. The front has a fussy-cut Westie face and is quilted - the back has a pocket for holding cards - credit cards, frequent buyer cards, gift cards or business cards. The pocket can hold 3 or 4 credit cards at one time. The first batch of fabric yielded only two of these card holders and they sold out quickly! I ordered more fabric and have more in stock now (if they sell out again, I'll order more fabric). I couldn't bear to waste a single inch of this fabric! So the odd bits and pieces were turned into key fobs in two sizes. Once again, I used a design from Embroidery Garden, the blank version of EGs Monogram Key Fobs. Each key fob has at least one Westie face showing. 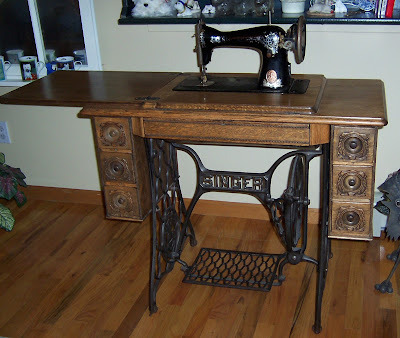 I couldn't decide which side should be the top - the end with the hardware (as shown in my photo) or the loop side. It depends on how you hold your keys ... so some of the fobs have the Westie ears pointing towards the hardware and some are turned the opposite direction. I sold out of the first batch of small key fobs, too! They're back in stock again - for now. :-) And I have several large key fobs ready to go. I've had this Westie Full Body embroidery design for several years - it was one of the first designs added to my 'collection' when I began exploring machine embroidery. These designs appealed to me because of the texture created by the stitches that closely resembles a real Westie coat. Back then, I didn't understand all the ins and outs of using the right stabilizer and choosing thread colors for subtle shading, so I gave up trying to embroider this design, as well as the Head Study (below). Now that I have a little more experience, I thought I'd try stitching out both designs again - and they turned out great! Each of the coin purses with Westie embroideries requires two embroidery sessions - one to do the Westie design and a second to create the in-the-hoop design. 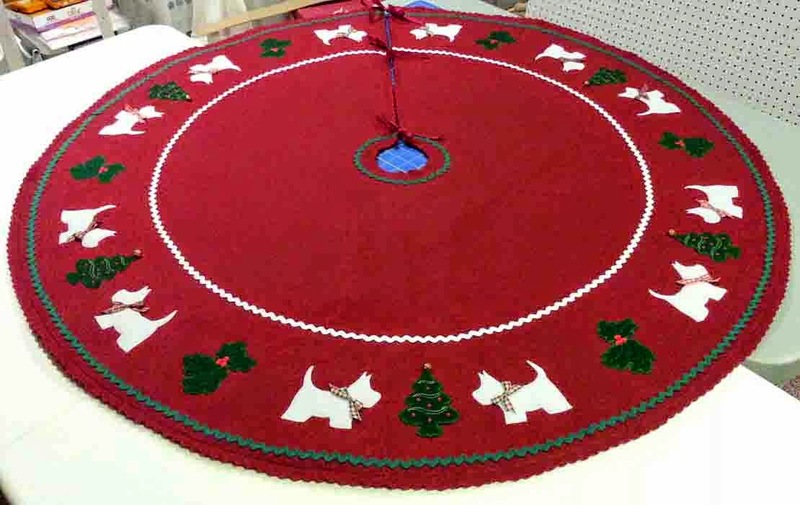 The Westie embroidery is done on cotton quilting fabric with fusible knit interfacing applied to the back and medium weight cutaway stabilizer in the hoop. I experimented with several different weights of cutaway, tearaway and fusibles before deciding that this stabilizer combination resulted in the least amount of puckering of the fabric. The Westie Head Study design was stitched out the same way. After they were embroidered, I carefully cut the fabric so the designs were centered, then used the same in-the-hoop zipper case design (mentioned above) to make the coin purses, omitting the front quilting stitches. One of the first items I listed for sale was this coin purse, made from an out of print design with a variety of dog faces in black and white with red collars and bandanas. I had only one fat quarter of this fabric in my stash and was able to make 2 coin purses with the 'Westie' face featured on the front. Oh how I wish I could find more of this fabric! But not finding it inspired me to look for other options - like embroidering the Westies and searching Spoonflower.com. * A portion of the sales price of each of these Westie-themed accessories is donated to WestieMed or Westie rescue. My Westie, Abby Gayle, is the best little dog. Such a sweet, onery personality!! I can't imagine life without Abby!